L.O. Lynch Quality Wells and Pumps, Inc. has the most modern drilling equipment in the industry today. All service trucks are stocked with the parts to repair a pump usually on the first call. All of L.O. Lynch's employees are experienced and trained on the newest technology in the industry. As a licences contractor with the state of California and registered with the local environmental health agencies, we are knowledgeable and experienced in all formations of vertical well drilling. Our pump department installs and maintains submersible, turbine and booster pumps, as well as design and installation water storage tank systems for both fire protection and domestic use. In 1945, L.O. Lynch began operations in the Hemet Valley area; offering well service to an area thirsty for water. Since then, L.O. 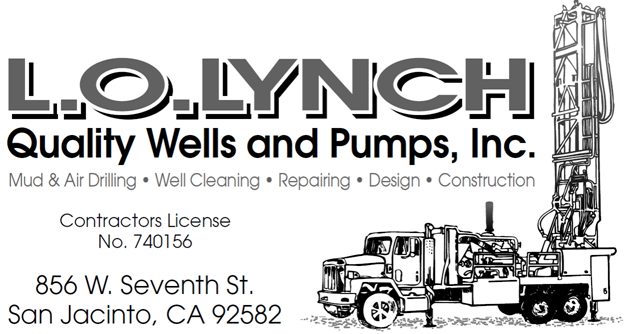 Lynch has expanded to the entire Inland Empire and beyond.Our services range in drilling and servicing wells from the domestic use to city, county and state wells along with some of the largest water companies in the area.